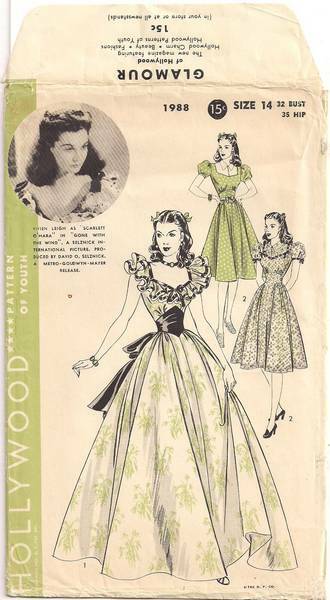 Vintage 1930's Hollywood sewing pattern number 1988 from the movie "Gone With The Wind" produced by David O. Selznick. This is styled after the gown worn by Scarlett to the Barbecue in the beginning of the movie. 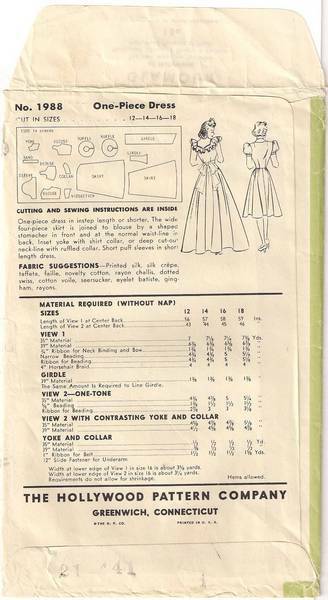 "One-piece dress in instep length or shorter. The wide four-piece skirt is joined to blouse by a shaped stomacher in front and the normal waist-line in back. Inset yoke with shirt collar, or deep cut-out neck-line with ruffled collar. Short puff sleeves in short length dress." The pattern is complete and it is in exceptionally well preserved condition. The pattern pieces do not appear to have been used but if they were used it was done very, very carefully. The envelope has some very minor edge wear; lighter than average aging; no markings or writing. See additional images below for full front and back views of envelope.